Size: 20" x 14" x .75"
Case Sensitive. Lowercase is basically capitalized, but smaller for this font. Spelling & punctuation will appear exactly as you entered it on your order, so if you want an apostrophe "s" to a name, you must add it. Please note, the more characters you request, the smaller the text will be. eg. EST. 2009, Austin, TX. Case Sensitive. Lowercase is basically capitalized, but smaller for this font. Spelling & punctuation will appear exactly as you entered it on your order, so if you want an apostrophe "s" to a name, you must add it. Please note, the more characters you request, the smaller the text will be. 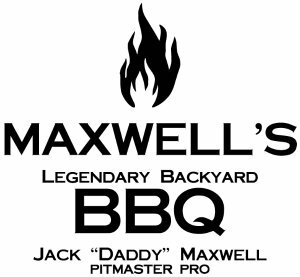 The master griller you know will put this barbecue cutting board to good use. 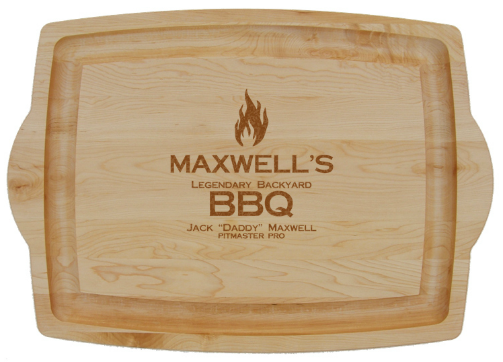 This quality Personalized BBQ cutting board with handles is a wonderful gift for yourself or your gift recipient. It is made of top quality maple from the New England area in the United States. Not only can it be used for chopping and carving it is also ideal for serving appetizers or other foods. This barbeque cutting board features side handles and a moat so the juice from your foods do not spill off the board. Personalize with your last name, full name and a 3rd line of text. Made in the USA. Measures 20" x 14" x .75". The custom precision etched engraving on this all maple cutting board is truly unique and adds a personal touch. PROCESSING/SHIPPING: Approximately 1-3 business days for processing and 2-5 business days for shipping. NEED IMMEDIATELY? See IN A RUSH? See Holiday and Father's Day Shipping Schedule in May, June, November & December.